CGWA Business Partner Highlight – Columbia Gorge Wind & Water Assoc. STONEHEDGE GARDENS – A BEAUTIFUL WINE AND DINE VENUE – IS A STALWART BUSINESS SUPPORTER OF CGWA – THANKS, MIKE CALDWELL AND STONEHEDGE! CGWA wants to thank Stonehedge Gardens Restaurant for being the annual sponsor and venue for our Pray for Wind Party, part of summer Beach Bash festivities in June. Because Stonehedge hosts the Pray for Wind Party for us, we are able to fundraise even more support for the CGWA Grom program, which is teaching the next gen of windsurfers the love of our sport and the great outdoors. Stonehedge is a killer venue- a beautiful historic home, great for fine dining with an amazing outdoor patio setting, perfect for special events. The patio creates a great mood with twinkle lights, outdoor fire pits, tiki torches, cobblestone floors, live music and of course, great food and drinks. Also on property is an outdoor wedding venue, tucked into 7 acres of forest woodlands. Stonehedge has a great happy hour, fantastic menu and wines – nice hospitality – we can’t say enough about these guys. 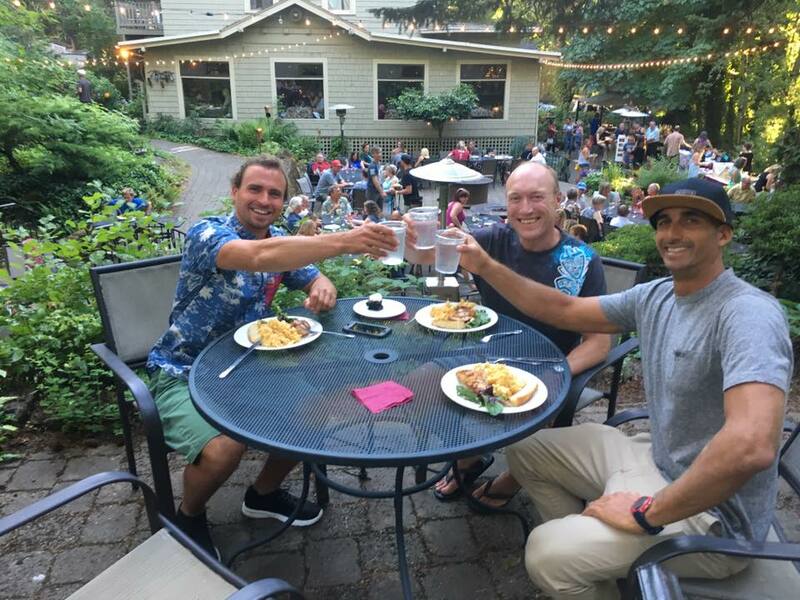 They host weddings, catered events and the owners are very active in the Hood River community. Special thanks to Mike and Shawna Caldwell for their support of CGWA. Mike’s a windsurfer and has been supportive of the Groms program, which is all about opening up windsurfing for more local youth. Stonehedge is a perfect stop for your next date or outing – they’re located off Cascade Avenue on Hood River’s west side, near I-84 and Cascade Ave. Please show Stonehedge your love – next time you are out and about, for happy hour, events or a fantastic meal. I-84 to exit 62, right onto Cascade St., next right onto Wine Country Ave – up two blocks on the left – road winding up into the trees.